Charles Morgan was a shipping and railroad magnate who earned most of his fortune moving freight through the southern United States. A Connecticut native, he became one of the most esteemed New York millionaires of the 19th century. Like many of his peers, Morgan used his great fortune to bolster his reputation through philanthropy. Among his many charitable efforts was the building of a new high school in Clinton, Connecticut. 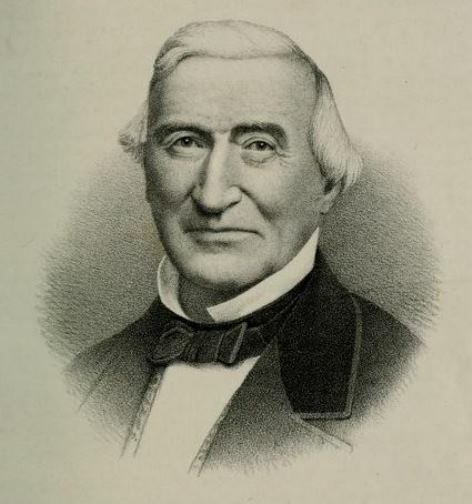 Born April 21, 1795, in Killingworth (now Clinton), Connecticut, Charles Morgan moved to New York City at the age of 14 and began an import and chandlery business. (The term chandlery describes an enterprise that provided gear and supplies for sea-going vessels.) He soon branched out, however, into merchant shipping and ran several sail and steamship lines to the southern United States and West Indies. Focusing on improving transportation in the South, Morgan opened the first regular steamship line between New Orleans and Galveston in 1837. He then expanded his routes to destinations such as Key West and Corpus Christi. As a northerner running ships throughout the South, Morgan’s vessels faced harassment and seizure by both Union and Confederate forces during the Civil War, but he still managed to turn a profit from lucrative wartime contracts. At the conclusion of the war, Morgan again focused on his business in the South. He began integrating the service of his shipping routes with those of the rail lines running in Louisiana and Texas, and he even constructed the first deepwater shipping channel between Houston and the Gulf of Mexico. Morgan’s successes allowed him ample opportunities to distribute his wealth among a number of worthy causes. One of the beneficiaries of this philanthropy was his old home town of Clinton. In 1869 and 1870, Morgan purchased land on Main Street in Clinton and paid for the construction of a new town high school. 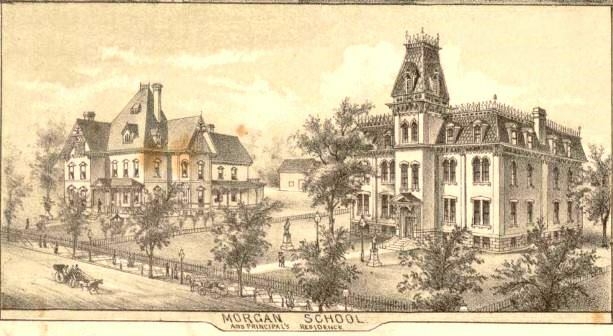 Bolstered by the support of an endowment set up by Charles Morgan to cover annual operations and maintenance costs, officials dedicated the Morgan School on December 7, 1871. The school officially opened the following spring and hosted students from Clinton and nearby towns such as Madison, Saybrook, and Deep River. In appreciation, the town commissioned a statue of Morgan to stand out in front of the school. Its unveiling came on June 23, 1875—taking place just three years before Morgan died in New York City in May of 1878. Morgan, Nathaniel H. Morgan Genealogy: A History of James Morgan, of New London, Conn., and His Descendants; from 1607 to 1869. Hartford, CT: Case, Lockwood & Brainard, 1869. Link.